In this article, we’ll discuss what it takes to setup “central subscriber with multiple publishers” replication model, to create an aggregate dataset from multiple sources, and you’ll also see how to scale with the data. The “central subscriber–multiple publishers” model is commonly used in situations where data from multiple sites needs to be consolidated at a central location while providing access to the local site with local data. A shipment data warehouse is a typical example. Where orders are placed at all publisher locations and the order confirmation details are pushed to central subscriber from which the order is shipped to the respective parties. In short, the multiple publisher databases replicate their data to the same subscription table but the process may pose a unique problem. We need to have a model to include the information to create a unique identifier for every row in every publisher database. For example, in this model, several publishers replicate data to a single, central subscriber. Basically, this is a process to support the data consolidation concept at a central database. In some other instances, the publisher databases replicate the data at the table level. In this case, the synchronization is straight-forward, as we deal with higher granularity. For each article to be published in a Central Subscriber topology, a unique identifier should be defined to leverage the action. We can use a lookup table to generate the unique combination of rows in all the publishers. To publish rows from Publisher 1, unique combination of keys is defined in the article so that it will not end up in creating a duplicate row. Likewise, to publish rows from Publisher 2 and Publisher 3, and Publisher 4, the same logic is placed across all the articles. Load the data into the Orders table on entire 4 publisher database. For example, the insert statement is generated in combination with region-specific details. In this case, the Order_id and Region_ID is a primary-key constraint. Query the publisher and subscriber database. You noticed that there are missing numbers of rows at the subscriber database. In Select data sources, leave the default Online transaction log option. This option allows the application to read online transaction log files. Now, In the Filter setup, select continuous auditing feature. The tracking file is a unique feature and it induces an intelligence to track the entire transactions by maintaining the LSN (Log Sequence Number) value. The safeguards integrity of the entire transactions. In the Tables, select the object to be published on the central subscriber. In this case, the table Orders is selected as publishing article. The configuration is all most done for the publisher database. Let’s save the batch script in the “Batch file”. Save the command as replication.BAT. Next, prepare the CLI commands for other publishers. In this case, the CLI commands are integrated. It is very simple and straight-forward. You need to copy and paste the content one after the other as per the number of publisher databases. As you see, the ‘/database’ switch has four different databases and the ‘/continuous’ switch has four unique tracking files. Invoke-SQLcmd -inputfile "G:\replication\Publisher1_$datetime.sql" -serverinstance "hqdbt01" -database "AdventureWorks"
Invoke-SQLcmd -inputfile "G:\replication\Publisher2_$datetime.sql" -serverinstance "hqdbt01" -database "AdventureWorks"
Invoke-SQLcmd -inputfile "G:\replication\Publisher3_$datetime.sql" -serverinstance "hqdbt01" -database "AdventureWorks"
Invoke-SQLcmd -inputfile "G:\replication\Publisher4_$datetime.sql" -serverinstance "hqdbt01" -database "AdventureWorks"
We can see that the aggregated set of rows got inserted into the subscriber databases. 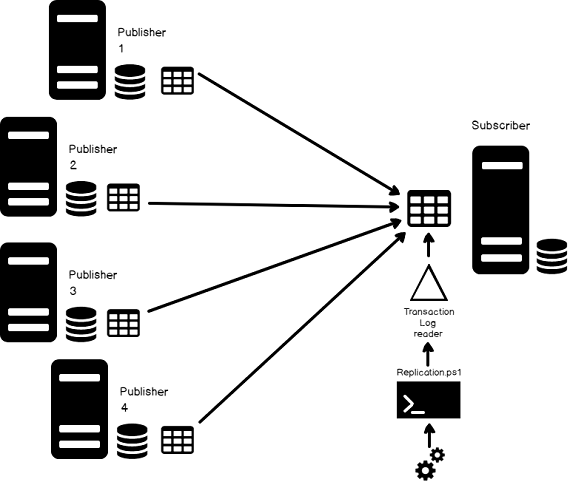 In the article we reviewed the “central subscriber with multiple publishers” use-case and then designed and built the system using a 3rd party tool, ApexSQL Log, a SQL Server transaction log reader, and common scripting technologies e.g. batch files and PowerShell. I re-iterate the importance of replication design. Data replication design is a balancing act between managing data at its various forms. Replication design techniques are vital and things get complicated quickly if we’ve not designed properly. For example, in this model, subscribers should be treated as read-only because changes are not propagated back to the publisher. So inserts, updates, and deletes should be avoided at the subscriber database as this could lead to non-convergence.